How should I dress for TV? is a question we are regularly asked, so this week we are repeating one of our best performing posts of all time. Any sort of jacket is a good idea on TV, partly because it gives somewhere easy to attach the microphone. As an overarching principle, start with ‘normal business wear’. We are not talking here about dressing as a TV presenter or as a celebrity (they do not need our advice). But if you are being interviewed as a representative of an organisation wear something that would be appropriate if you were going into the office. This will clearly be different if you work for a tech company where jeans and a black polo may be the norm, compared to running a bank where you will be suited and booted every day. If you work for an NGO you will likely wear different clothes than someone running a funky design company. Whatever you would wear for work will probably work if you are being interviewed on TV. Women need make-up. I remember seriously offending someone from a very politically correct NGO by saying this but I stick to my view: it is a bad idea to go in front of the camera without make-up. Firstly, it is important to understand that TV lights are harsh and will be unflattering. Secondly, almost every other woman on the programme will be wearing lots of make-up and you will look odd if you don’t. Clearly, there are exceptions; if you are reporting on saving lives in a war zone there are more important things to worry about. Orla Guerin MBE is a BBC journalist who reports regularly from the Middle East and is a legend in her own lunchtime. I don’t know for a fact that she never wears make-up but it certainly doesn’t look as if she does. But I totally make allowances as a viewer as she is usually wearing a flak jacket and interviewing distraught relatives of recent victims of some atrocity or other – and absolutely clearly has other things to worry about. But if she was in the studio doing an interview I am sure she would wear make-up and so should you. This does beg the question what sort of make-up? My topline advice is a good foundation and take steps to make your eyes stand out. Use blusher if you need it and normally wear it while lipstick is optional. The safe wardrobe option for an interviewee is jacket and t-shirt, it is the outfit most often chosen by female television presenters. For most of our clients, the ‘safe’ outfit for a woman interviewee is a jacket and T-shirt or jacket and shift dress. The T-shirt should not be too low on the neckline – any cleavage is distracting so you may choose to avoid showing it. Similarly not too high on the neckline: polo necks are very rarely seen on TV for good reason. They are too hot for a studio environment. Most female newsreaders stick to the jacket and T-shirt formula and it is a very safe one. Having a jacket also gives somewhere to clip on the microphone and saves any embarrassing need for wires up under a dress or pulling a delicate top out of shape. Avoid scarves and overly large jewellery: simple lines are the least distracting. Avoid scarves and overly large jewellery. I would advise trying to keep a clean ‘unfussy’ image and amazing jewellery will again only distract from your message. Dangly earrings are to be avoided as they will move and again distract from what you are saying. The vast majority of TV interviewees are shot from the midriff upwards, something that is called a mid-shot. However, unless you absolutely know that is how the interview will be shot you may want to give some thought to the bottom half! Crucially, if there is even a remote possibility that you are going to be on a low settee – do not wear a short skirt. If you do you will surely spend the whole interview tugging at the hem at and worse being distracted by the amount of leg on show. Jackets can be worn with a shift dress but if it’s too short you might be worried about showing too much leg. How to Dress for TV: What Colour? People often ask ‘what colours can I or should I wear?’ The truth is it makes very little difference these days so long as you don’t wear checks. 20 years ago camera technology struggled to cope with black, white, bright red etc. Today, black and white are best avoided if possible but only because they can be unflattering in harsh light. Softer colours are more flattering. However, one important rule remains; don’t wear high contrast checks. If you do the picture will ‘strobe’ making it look as though you have recently been standing in a nuclear bunker. While this is not a crime, it is distracting. Hair off the face. If you have long hair consider tying it back. Viewers need to see both your eyes to trust you. Also, there is nothing more irritating than someone constantly flicking their hair back off their face. Finally, where you look during the interview is much more important than what you wear. Hold the eye line with the interviewer as much as possible unless you are doing a ‘down the line’ in which case you will need to stare down the lens of the camera. TV lighting means it is a good idea to wear make-up if you are being filmed. 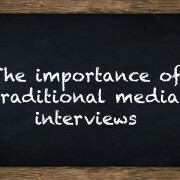 If you want to prepare for a television or radio interview why not book a session with us in a studio. We can provide a realistic run-through and you can watch and critique your own performance as well as enjoying expert coaching. That all means you are much more likely to get it right on the day. We have posted in the past about the importance of how to sit and stand on TV – you can read this post here. But don’t just take our word for it, here is another article about what to wear on TV. Also, be aware that if your interview is going to be broadcast in Muslim countries, it is advisable to have a high neckline. And, necklaces should be avoided – they usually bang on lapel microphones. Similarly, bracelets will often knock on desks which will be picked up by microphones.